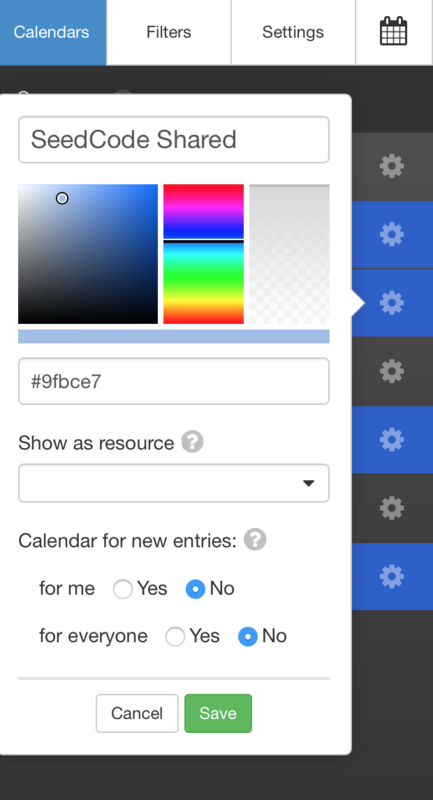 DayBack lets each user decide which calendar should be used for new events. This setting is available for each calendar by clicking on the gear icon beside each calendar in DayBack's left-hand sidebar. The "for me" option is available for each of your users provided you have NOT set one of the calendars to be the default "for everyone". Only admins can see the "for everyone" option. So if you set a calendar as the default "for everyone" then your users will always use that calendar by default for new events. If you leave that setting at "no" then each user can pick their own default calendar for new events. How can I create events for a specific source? If only one source is visible (is turned on in the Sources tab) then DayBack creates the event in that source unless that source is read-only. If multiple sources are shown, and the default source is among them, DayBack uses the default source. If multiple sources are shown, and the default source is NOT among them, DayBack uses the first visible source that is not read-only.